A little more cream in the base which I expected to see from the photos. Nice for the price!! Coco Paradise is a tasteful tropical print on a super soft cotton. 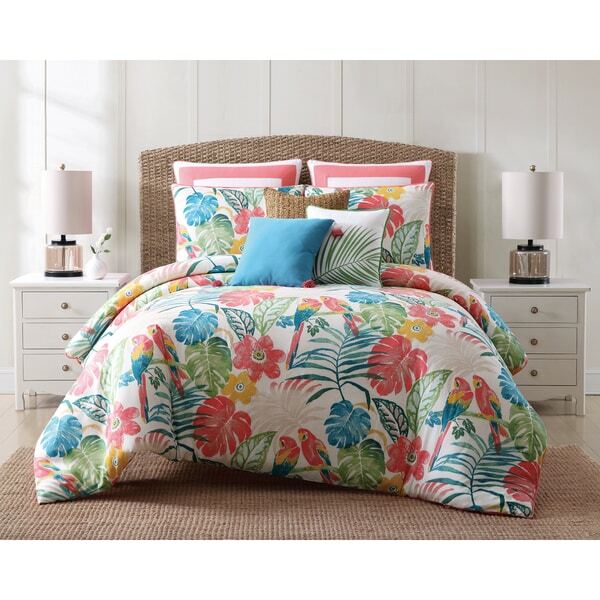 Build your bedroom around this tropical inspired printed cotton Duvet set. 100-percent cotton shell, oversized. Imported. Machine washable. Love, love, love this. It is so beachy and puts you in a great mood. Duvet fitted perfectly and was soft and comfortable. The colors, pattern, and PARROTS ! ! ! It has same colours as my summer quilt so will change over to winter with my duvet in it.